The USN Blue Lab Whey Protein is scientifically formulated with whey isolate, hydrolysate and concentrate to support muscle development. Our great tasting shake provides you with an impressive 25g of protein per 34g serving. Each serving contains 5.5g of naturally occuring BCAAs. Our easy digesting whey formula contains Tolerase, a pH stable lactase enzyme contributing to improved lactose digestion, ideal for those who have difficulty digesting lactose. 1 serving: Add 1 scoop of powder (30g) to 175ml of ice cold water and shake or blend for 10 seconds. 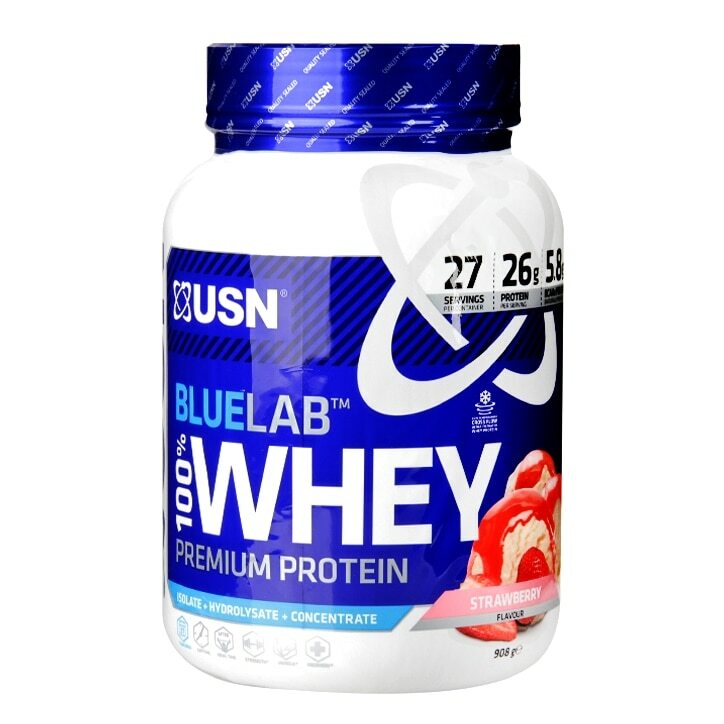 USN Blue Lab 100% Whey Strawberry is rated 5.0 out of 5 by 5. Rated 5 out of 5 by Monkey Hanger from Excellent Protein Supplement. I have tried many other good named brands but found this new USN Bluelab Ultimate Whey Protein to be the best for me. It is lovely tasting, easy to mix ( I use milk and a blender), and I find this product to be the best for me and have since reordered again. Thanks Holland & Barrett for the fast delivery.